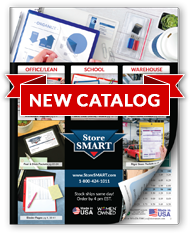 StoreSMART's Rigid Print Protectors with Easel Backs give your posters, menus, and legal documents the protection they deserve! Each rigid-edged protector is crafted of clear, "non-migrating" PVC vinyl that contains no plasticizers or stearates, which means they won't harm your beloved collectibles or important work documents. Help your favorite prints retain their value while they're being displayed or stored—and protect them from everyday disasters such as dust, water, and exuberant children—by pulling them out of their envelopes and paper tubes and sliding them into one of our professional print protectors. With the easel back attached to the back, your posters, menus, and legal documents will really stand out! Protect workplace safety posters from staining and fading. Or join hundreds of successful restaurants by using our protectors to house menus. No matter how you choose to make use of them, your important materials will be safe and sound. Overall size: 8 13⁄16" x 14 1⁄8"
Inside capacity: 8 ½" x 14"
8" Easel back attaches in either portrait or landscape mode.